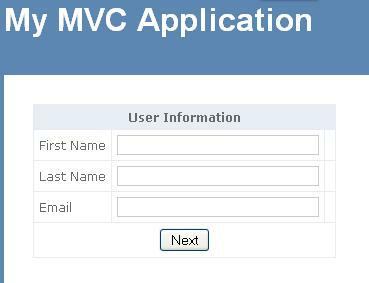 In asp.net web form application, if we need ajax service, we will need to create wcf services on server side to serve ajax calls, while in MVC web application(version 3), no wcf is needed, a controller will do. Now just see what makes the client side validation possible with dynamic contents. First of all note that ASP.NET MVC will emits client side validation script only if you have Html.EnableClientValidation() (which internally sets ViewContext.ClientValidationEnabled = true) inside your view or partial view. Client side validation for dynamic contents will still not work unless you call Sys.Mvc.FormContext._Application_Load() function(which simply do some initialization) in your dynamic contents(partial view). Another very important point to note here is that dynamic contents includes a html form. 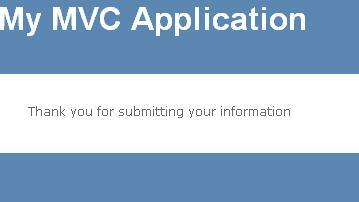 This is necessary because ASP.NET MVC emits the validation script during MvcForm.Dispose method. Therefore if you do not have Html.BeginForm in your dynamic contents, no script will be emitted, due to which client side validation will not work. Another key point to note here is that client side validation is explicitly invoking using, (!Sys.Mvc.FormContext.getValidationForForm(this).validate('submit').length). If the form is valid then I am just using jQuery.post to post the form to server asynchronously and get the dynamic contents and update the document. This is important to prevent the traditional postback because by default ASP.NET MVC client side validation library do a complete postback if the form is valid. 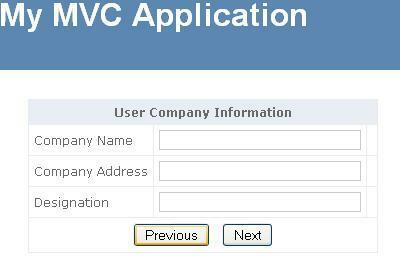 With the arrival of ASP.NET MVC 3, it is very easy for us to handle errors in ASP.NET MVC. The HandleErrorAttribute in ASP.NET MVC lets us specify how to handle an exception that is thrown by an action method. 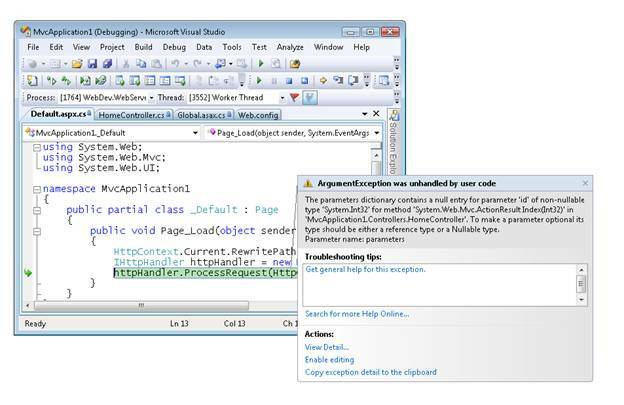 By default, when an action method with the HandleErrorAttribute throws an exception, MVC displays the Error view that is located in the ~/Views/Shared folder. This filter automatically applies to any action method in any controller so that you don’t have to apply HandleErrorAttribute action level or controller level. If user makes a request for web.config file (http://yourDomain.com/web.config), and we know that MVC restricts this request and throws an exception that is uncatchable by HandleErrorAttribute because HandleErrorAttribute just handles errors that are thrown by action methods. So for above case, traditional asp.net error window will be displayed. Here is a diagram that show how HandleErrorAttribute works? So how to handle errors that are not thrown by any action method means that errors those are unhandled or uncaught able by HandleErrorAttribute. Now, whenever an error thrown by any action method, HandleErrorAttribute are asked to handle it and ~/Views/Shared/Error.aspx view will be displayed. In contrast, when an unhandled error will occur that is not thrown by any action method, this Error.aspx file will be displayed to end user. Oh no, this technique is for Error.aspx but what for ~/Views/Shared/Error.cshtml? In this post I’m going to show you how to use MvcScaffolding to add a new controller template to enable scaffolding with data access code that uses the Repository Pattern. One of the new features is built in tooling support for scaffolding. The “Add Controller” Dialog box has been revamped to include a few new options. - Template: Allow you to specificy what kind of controller you want to generate. 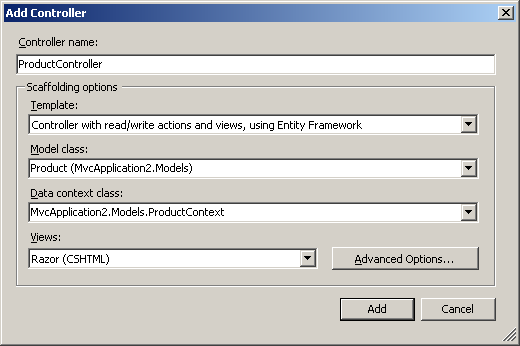 Out of the box you get an empty controller (Just a class with no actions), Controller with actions and views using the Entity Framework code first, and controller with empty read/write actions. - Model: This is the object that will be used for scaffolding strongly typed views, CRUD actions and data access. - DataContext: By default this is an EF Code First class that inherits from DbContext. You can either select an existing context or have the scaffolding tools create a new one for you. - Views: Select between ASPX and Razor. This is pretty much the same as the “Add New View” dialog box. - Advanced Options include layout/master page settings and View script settings. Again, stuff that is also in the “Add New View” Dialog. 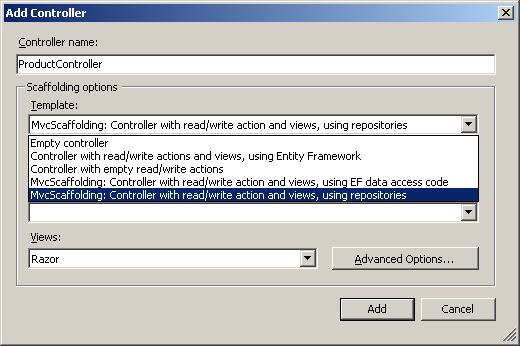 Scaffolding using the “Controller with read/write actions and views, using Entity Framework” is especially cool because it generates a controller, all associated views AND data access code for you. That’s right, all you need to do is create an model class and the scaffolder does the rest. How’s that for a productivity boost? The new tooling support created a new controller, all associated views and the data access code. That’s really cool, but let’s take a look at the controller code. By default the scaffolding tools use the ProductContext object directly in the Controller. Many people don’t like this coupling (myself included) and prefer to use the Repository Pattern. This allows us to abstract away our data access code behind a repository, making it easier to work with and later modify, if need be. Well the good news is that the add controller dialog is extensible. You can add your own controller templates to enable data access using any technology mechanism you want. I’m going to show you a way to get a repository option for EntityFramework to show up with very little work. All you need to do is install the MvcScaffolding NuGet Package. The last option let’s you scaffold out the entire thing and use repositories for data access. Go ahead and click “Add”. Check the checkboxes to allow the scaffolder to override existing items. Now the controller uses a repository instead of hard coding in the data access code. The repository itself uses EF Code First to do all the data access. In this tutorial, you are introduced to an important feature of every ASP.NET MVC application called ASP.NET Routing. The ASP.NET Routing module is responsible for mapping incoming browser requests to particular MVC controller actions. By the end of this tutorial, you will understand how the standard route table maps requests to controller actions. 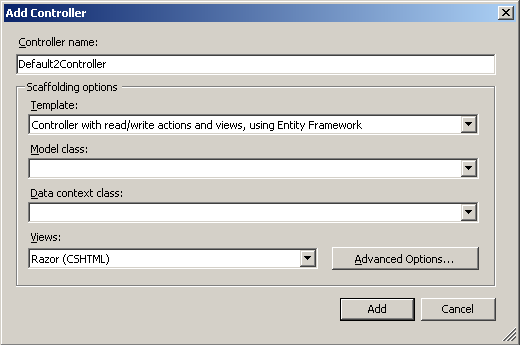 When you create a new ASP.NET MVC application, the application is already configured to use ASP.NET Routing. ASP.NET Routing is setup in two places. First, ASP.NET Routing is enabled in your application's Web configuration file (Web.config file). There are four sections in the configuration file that are relevant to routing: the system.web.httpModules section, the system.web.httpHandlers section, the system.webserver.modules section, and the system.webserver.handlers section. Be careful not to delete these sections because without these sections routing will no longer work. Second, and more importantly, a route table is created in the application's Global.asax file. The Global.asax file is a special file that contains event handlers for ASP.NET application lifecycle events. The route table is created during the Application Start event. The file in Listing 1 contains the default Global.asax file for an ASP.NET MVC application. The default route table contains a single route (named Default). The Default route maps the first segment of a URL to a controller name, the second segment of a URL to a controller action, and the third segment to a parameter named id. The Default route includes defaults for all three parameters. If you don't supply a controller, then the controller parameter defaults to the value Home. If you don't supply an action, the action parameter defaults to the value Index. Finally, if you don't supply an id, the id parameter defaults to an empty string. Because of the Default route parameter defaults, entering this URL will cause the Index() method of the HomeController class in Listing 2 to be called. In Listing 2, the HomeController class includes a method named Index() that accepts a single parameter named Id. The URL /Home causes the Index() method to be called with an empty string as the value of the Id parameter. Because of the way that the MVC framework invokes controller actions, the URL /Home also matches the Index() method of the HomeController class in Listing 3. The Index() method in Listing 3 does not accept any parameters. The URL /Home will cause this Index() method to be called. The URL /Home/Index/3 also invokes this method (the Id is ignored). The URL /Home also matches the Index() method of the HomeController class in Listing 4. In Listing 4, the Index() method has one Integer parameter. Because the parameter is a nullable parameter (can have the value Null), the Index() can be called without raising an error. Finally, invoking the Index() method in Listing 5 with the URL /Home causes an exception since the Id parameter is not a nullable parameter. If you attempt to invoke the Index() method then you get the error displayed in Figure 1. The URL /Home/Index/3, on the other hand, works just fine with the Index controller action in Listing 5. The request /Home/Index/3 causes the Index() method to be called with an Id parameter that has the value 3. The goal of this tutorial was to provide you with a brief introduction to ASP.NET Routing. We examined the default route table that you get with a new ASP.NET MVC application. You learned how the default route maps URLs to controller actions. Hope the tutorial can help and give benefit for all of you.